TBV supports advanced real-time applications such as neurofeedback and brain computer interfaces (BCIs). The feedback will be conveyed to the subject during the experiment. A conceptional overview of a typical neurofeedback setup is shown in the picture below. In most cases a video projector is used to convey a visual feedback to the subject in the scanner (but auditory or tactile information has also been used with TBV). While TBV supports custom feedback visualizations by exporting ROI data in real-time to disk, one can in many cases simply use the in-built neurofeedback dialog to produce feedback visualizations. 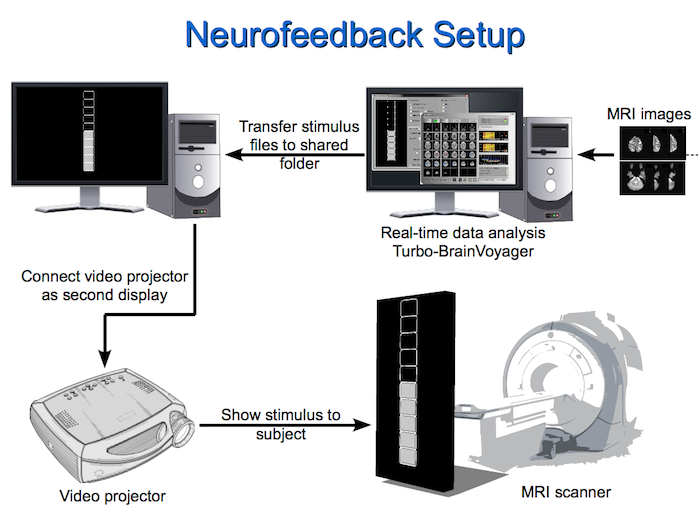 The neurofeedback dialog allows to select the data from one or more ROIs as the source of feedback information for a subject during an ongoing measurement. It constitutes a simple Brain Computer Interface (BCI) allowing to use different display formats for neurofeedback. The signal from a ROI can be presented in two major formats to the subject, either in thermometer display (see image above) or as time course plots. While TBV generates and displays feedback information, the TBV screen can not directly projected to the subject since it shows also other important information in its main window. The stand-alone tool “FeedbackPresenter” - available as part of Turbo-BrainVoyager - can be used on a separate stimulus presentation computer (see left upper part in the image above) to show only the feedback information. It reads the TBV-generated feedback files (e.g. images of the thermometer display) from a specified folder and displays them on the screen. As soon as a new image becomes available from TBV, it will be automatically detected and displayed to the subject in the scanner. For more advanced feedback visualizations, we also make available a comprehensive open source presentation software called StimulGL. StimulGL provides stimulus generation and control for fMRI and behavioral experiments. It is optimized for creating flexible behavioral experiments supported by a script engine and a plugin framework. For further information about StimulGL visit https://github.com/svengijsen/StimulGL/. Copyright © 2014 Michael Lührs and Rainer Goebel. All rights reserved.